The J-N class were the result of the Tribal class. These ships were the same size as the Tribals but sacrificed a turret to add an extra set of torpedo tubes. The first of each of the first 2 classes (J & K) were to be the leaders of the flotilla and also were earmarked for Captain Lord Mountbatten to be appointed to. The fittings to these two ships were a bit more sumptuous than their sisterships. With a decent dual purpose turret available there was no need for the JKN type with the open mountings. Those classes could be grouped with the LM type for a much larger class with better overall capabilities. 48 RN vessels were completed, 8 Australis type N class, and 4 Southern African L4 type. The moment you get rid of the Low angle guns and give the turret an 85 degree dual purpose arrangement with 4.5" guns, you give these ships a boost in usefulness. They were great looking ships and my favourite destroyers of WW2. But why oh why did the RN designers keep with those low angle guns.. It meant that when the twin 4.7" of the original timeline had a problem and some of the L class had to be fitted with twin 4" the RN designers actually ended up with a better armed ship than the originals. The L4 type had a better AA capability and in DD-v-DD battles the 8x4" outperformed the slower firing 4.7". AND it had the added benefit of not having to have any of the torpedoes removed to enhance the AA capability. The same steel and gun shortage of 1940-41 affected the J-N classes with the L class being converted to mount four twin 4" Mk XVI open mountings. A repeat class of the L's was ordered as part of the January 1940 War Emergency Building Program, but these were to be completed with the original 6x4.5" armament. The repeat order was to replace losses incurred by the J-K-L ships in the early months of the war. The J-N and Tribal class were all fitted with quintuple sets of torpedo tubes pioneered in the I class ships. All of the ships of these classes were heavily engaged in the Mediterranean where their AA capabilities were badly needed. The Admiralty was loathe to remove sets of torpedoes from these ships as they were the best of the 'Fleet Destroyers' available to them. When war broke out in September 1939, Jervis was under the command of Captain Philip Mack, and was leader of the 7th Destroyer Flotilla (DF) based in the Humber. The first six months of hostilities was taken up with sweeps across the North Sea, in "appalling weather conditions" which saw the Flotilla suffer a succession of storm and collision damage. During this time Jervis captured three blockade runners, one on the second day of the war, and helped search for the merchant ship SS City of Flint. In March 1940 Jervis was involved in a collision with SS Tor, a Swedish freighter, that put her in dock for the next three months for repairs. During this time Mack, as Captain (D) led the Flotilla from Janus, and in May 1940 sailed with her for the Mediterranean to take command of the 14th Destroyer Flotilla. Jervis' pennant number changed to G00 around this time In July, after working-up trials, she joined him in Malta, where he resumed command. For the next two years Jervis saw action in a constant round of operations; sweeps along the coast, bombarding shore targets for the Army, protecting convoys to Malta, and screening major fleet movements. In 1941 Jervis was involved in a number of fleet actions. In March she was at Battle of Cape Matapan. In the course of the battle she was involved in the destruction of the Italian cruiser Zara which had been crippled by heavy guns in attempting to recover the Italian cruiser Pola, which had been stricken by an aerial torpedo. Then Jervis came alongside Pola and boarded her, taking off the wounded before, with the destroyer Nubian, torpedoeing and sinking Pola. In April she led the force that annihilated an Axis convoy at the action off Sfax. In May she was in the battle of Crete, where so many Royal Navy ships were lost, including her sister ship Kelly. During the summer Jervis ran supplies to the beleaguered port of Tobruk, and in December she led the destroyers at the first Battle of Sirte. On returning to Alexandria, she was damaged in the Italian human torpedo attack on the fleet there; (which was commanded by Lieutenant Luigi Durand de la Penne). This left her in dock for six weeks; the same attack crippled the battleships Queen Elizabeth and Valiant. Released at the end of January, she resumed operations. In April she joined the Malta Strike Force, although without her captain; Mack left Jervis in March due to ill-health and was replaced as captain of Jervis, and Captain (D), by A.L Poland. He would command her, and lead the 14th DF, for the next year. 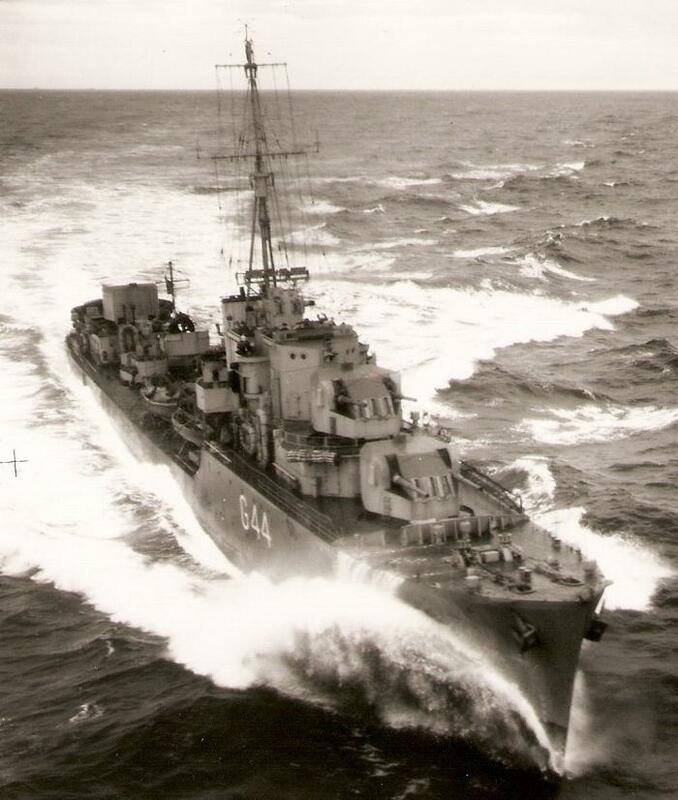 In March 1942, under Poland's leadership, she again led the destroyers at the second Battle of Sirte. On the night of 1/2 June, an Italian convoy of two supply ships escorted by a destroyer and a torpedo boat, was intercepted off the Straits of Messina by Jervis (Captain A.F Pugsley) and the Greek destroyer Queen Olga (Lieutenant Commander Blessas). A Wellington bomber dropped flares and after a short battle lasting half an hour, the two Allied destroyers sank the convoy and destroyed both escorts. Jervis also saw action during the landings in Sicily, Calabria, Salerno, and Anzio, as well as operations in the Adriatic. She supported both the 8th Army and Yugoslav partisans. In the Autumn of 1943 Jervis was in the Aegean supporting the ill-fated operation against the Dodecanese Islands. On 16/17 October with HMS Penn, sank Sub Chaser UJ-2109 at Kalymnos. Having returned to Britain after a re-fit, and no longer Flotilla leader, Jervis saw action at the Normandy landings under Lieutenant Commander Roger Hill, and in the closing stages of the war. She decommissioned in September 1944, paying off at Chatham prior to a further, major re-fit. Re-commissioned in May 1945, Jervis saw further service in the Mediterranean, policing the aftermath of World War II. She paid off into the reserve at Chatham in May 1946, and was then laid-up in the Gareloch where she was used for training of local Sea Cadets. Placed on the Disposal List in October 1947, she was one of a number of ships used for explosives trials in Loch Striven during 1948. Jervis was handed over to the British Iron and Steel Corporation for demolition in January 1949 and allocated to by Arnott Young, arriving at Troon, on the Firth of Clyde for breaking up in September.